In my contribution to the calendar, I want to talk about a type of drill that I find to be fundamental for two main reasons: firstly, because in my opinion it is the better and more game realistic concept compared to passing drills. Secondly that type of drill can help to establish a basic structure in possession whilst teaching the intuitive understanding of positional play. It’s about „linked rondos“ or “zonal positional games” – however you want to call it. The main idea behind it is to combine overload structures in separate fields within one game. For example, you play a 3v1 in the first zone, then a 3v2 in the second zone before having a 2v2 or even a 2v3 in the third zone where you can finish on two mini goals or a big one. 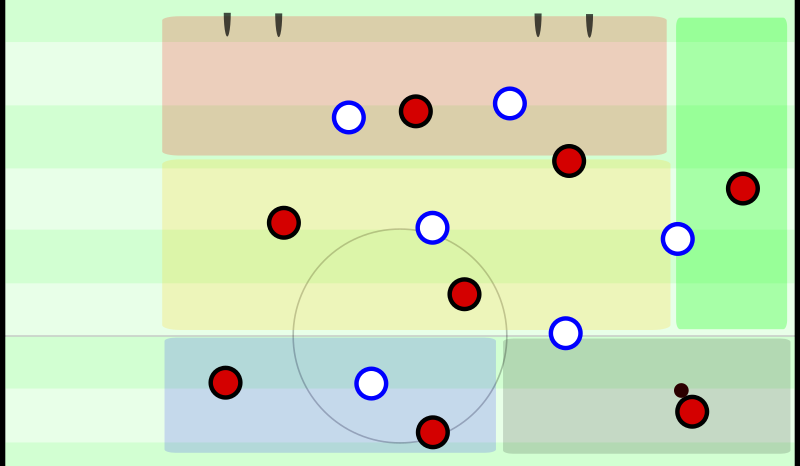 In this example, the team in possession of the ball would build up in a set 3-3-2 – the central structure of a 3-5-2 system. Due to the zonal restrictions the team is forced into a positional base structure within which they need to keep the ball through passing. Due to the comparably low pressure applied by opponents at the beginning, this set-up fits well to train the basics of passing. Thanks to the permanent numerical superiority, dribbles never actually become necessary and positioning yourself is very easy. It’s all about executing the ball circulation in the cleanest way possible. Within the set-up, you can coach all details of passing out from the back: body position before and after receiving, using the right foot to receive, direction of the first touch, pre-orientation, first look deep or diagonal, technical execution of the pass, coaching between each other (turn, lay-off, directions etc.) and the basic behavior within the space in relation to the position and to the opponent. Unlike usual rondos, you still have a game realistic structure and an orientation towards goal. As you progress from zone to zone, the pressure from the opponent also increases accordingly – just like in the real game. This way, the players learn to implicitly understand the necessity and impact of spacious ball circulation as preparation for playing within tighter attacking structures. Unlike in passing drills, the opponents also get immediate feedback about the quality of their actions. They are taught the necessity of clean execution while having game realistic orientation points in the process; better learning overall. Next to these advantages, the coaching within the drill doesn’t get worse and the coaching aspects can be kept clear at the same time. Furthermore, position specific details can be added and you don’t teach your striker to pass like a center back (although you could vary the positions easily, if you want to teach exactly that). The functioning of juego de posicion is taught implicitly and almost inevitably within this setup. Due to the zone boundaries and the allocation within the zones, it’s almost impossible for the players to destroy the positional structure or the distribution of space. This oftentimes happens in training games that leave more freedom to the players, because the players of the team in possession move towards the ball too much. If you include changes in who is in numerical superiority (e.g. 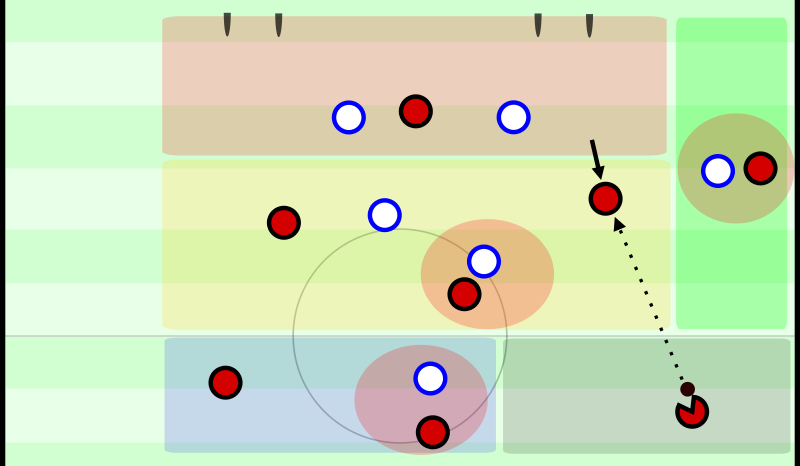 in a 4v4+2), multiple transitional moments are added to that and happen regularly which leads to players being organized in a bunch instead of having proper spacing. You avoid this in the described setup while situations in tight spaces and transitional moments (directed towards goal) still occur temporarily. Thanks to the big numerical advantage, the team in possession won’t be under a lot of pressure at the beginning of such a drill, if they execute their actions properly. This leads to the ball far players staying in their respective positions as they don’t need to react with the (rather ineffective) reflex of coming closer to their stressed team mates in order to provide “help”. The team develops a proper ball circulation, instead. Thus, the ball far players will get the feeling that the ball will arrive, if they just wait for it. They experience situations of seemingly not being involved in the game. 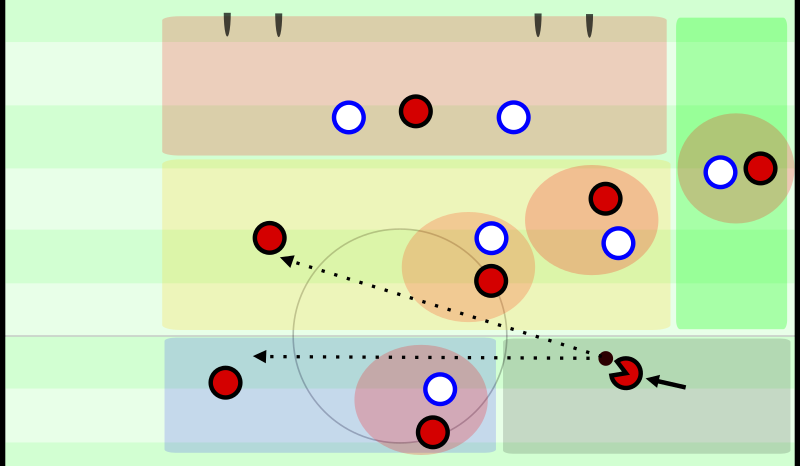 But this can change quickly after some combination play and they, all of a sudden, receive the ball in a lot of space. Like that you can use a rather rudimentary level of opponent pressure to build a foundation which can be used later on when you work on the fine-tuning in more game realistic setups and increase the level of play. The game can be enhanced and opened up in a number of aspects: More freedom for the defensive players makes it necessary for the team in possession to be more flexible and to orient themselves more inside the structure. Additionally, the deeper passing options can act more freely and need to adjust their position accordingly while coordinating themselves with the players closer to the ball. Furthermore, you can gradually integrate the structure for 11 versus 11. In our example, you can add the wing-backs to the 3-3-2 in the areas next to the original zones. For playing in a 4-1-2-3, you can start with 2-1-2 versus 1-1-1 (or 2-1), increase it to a 2-1-4-1 against a 2-3-1 with more freedom for the offense, before playing in a 4-1-2-3 versus a 4-3-1 or 4-3-2 and eventually arriving at the 11 versus 11. Within this framework, the players can implicitly learn the functioning and structure of the system step by step. Once they master the foundations of the formation, you can enhance it once again and create the orientation within the system. 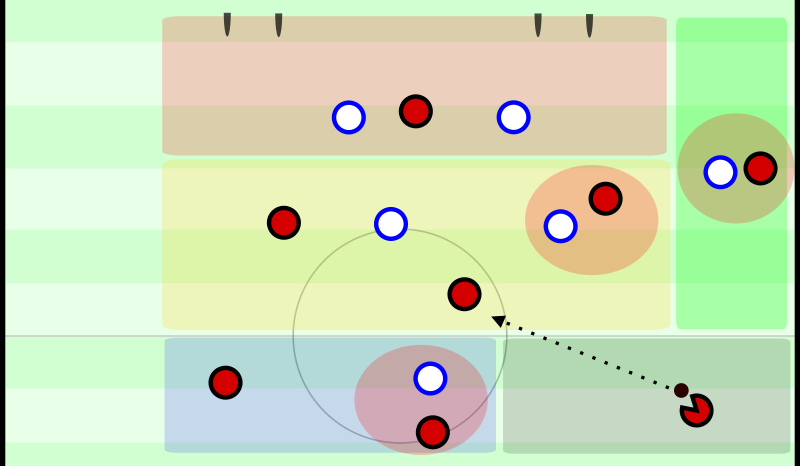 As a consequence, you (approximately) arrive at the point, where the right pass is played in the right moment; the ball is only passed outside when the opponent pulls enough players to the centre. Once the opponent’s defenders orient themselves forwards, you play past them vertically. If the opponent can create a numerical superiority on the outside, you look for a switch. The logic behind these passing decisions as well as the “hierarchy” of the options can be achieved through a gradual progression, if you choose the different stages properly and coach the options accordingly. This includes certain „reads“ about when the players need to orient themselves where. The structure makes it easier to organize such reads, and to create situations in which you can use them comprehensibly and effectively. When planned optimally, the changes in orientation even happen automatically without explicit coaching. But the latter becomes necessary, once more mistakes happen. If you now, for example, open the midfield zone for the defending striker, there will also be situations where he closes down the #6 and you need to switch using the central defender. In my way of thinking, teaching this structure specific orientation and decision making is crucial for the functioning of a system. 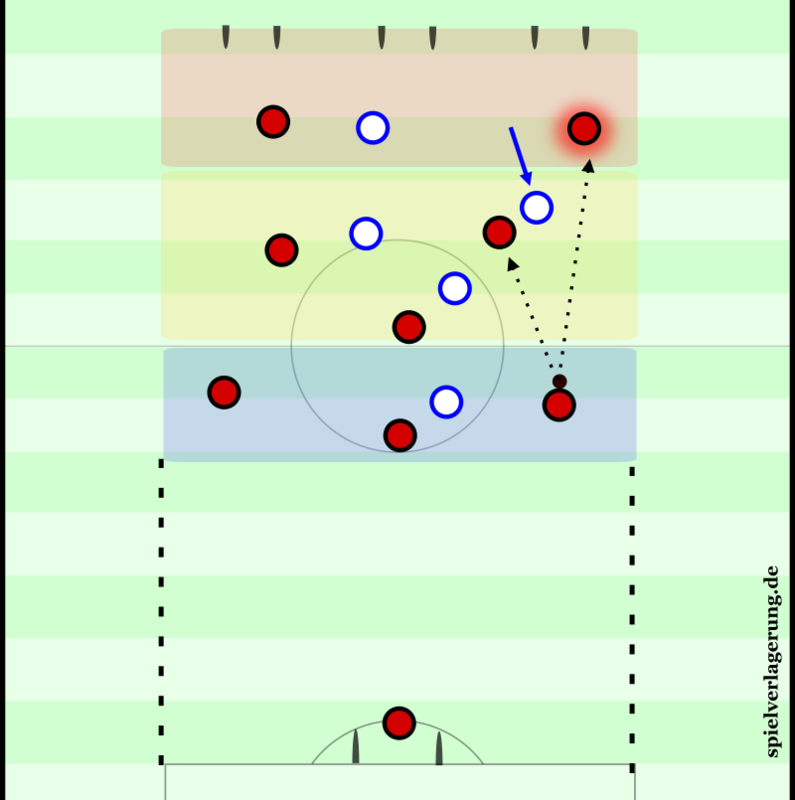 It’s the most frequent mistake in the build-up, when you already have a working positional structure; players recognize too late that they need to change their direction or where the right target space should be for them in the specific situation. This skill is taught in an individual way within this drill. At the same time, you can improve the understanding of the positional structure as a whole and with that also the verbal communication between the players. Like that, the team should clearly become better in finding the free man against different pressing behaviors of the opponent and in finding the right moment to progress the game forwards. Once the attack carries on, it will also become clearer for the offensive players, when it makes sense to re-build and when to directly continue in the most effective way. Consequently, you can enhance the structure and the line of thinking up to 11 versus 11 but need to add depth in the last stages. Once depth is added, it becomes hard to use horizontal zones and you need to use vertical ones (which can be modified in a way that they are diagonally directed towards goal). With a good preparatory work in the training games, the team should be able to detect and pick good moments to play into depth: The previously built focus leads to the constant creation of free players within the own structure. Once the opponent moves forward to defend, these options will disappear – this is the perfect moment for passing into depth. You implicitly make sure that a maximum number of opponents is occupied, before the goal is attacked. At the same time, you constantly provoke the opponent to not secure the depth sufficiently in order to create access outside of their block. Like that, creating goal orientation is the last step, but it’s built in a very efficient way with an anyhow high quantity. In my opinion, the initial variation of this zonal game is a good fit as second warm-up drill after a tight, not really intense rondo. Regarding individual load it’s not much more than a rondo, but one would choose larger distances compared to that. Once you increase the freedom within the drill, you can also increase the intensity. This can also be done through coaching: At the beginning, the defense is rather semi-active, before pressing very intensely later on. A bigger variant with more freedom is ideal as main part of the session or just before the game at the end of the session. You already prepare certain tactical aspects and improve the structure in the free game at the end. Overall, this setup can be adapted and used in a flexible way. Finally, I want to emphasize that for me it’s not about the two concrete examples that I gave, but more about the general idea behind it. You won’t have a lot of success in training, when you just imitate these examples. Instead, it’s necessary to adjust the setup to your own ideas and to the training content. The setup can become confusing and ineffective, if the zones are too small or too big, the occupation of the zones doesn’t fit, the coaching is wrong or the progression within the drill isn’t done properly. In this case, it’s recommended to play a rather free game.